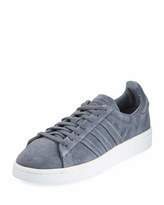 Adidas suede sneaker with on-tone suede 3-Stripes 1" platform heel. Round toe. Lace-up front. Logo-embossed heel counter. Padded footbed. Rubber outsole. "Campus" is imported.